Dr. Dunphy’s Soybean Variety Information Book has been compiled into a spreadsheet below. Data was collected from the NC OVT (2012 – 2017). 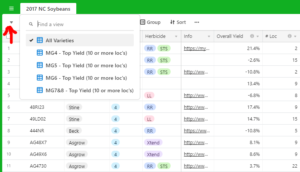 You can use this database to filter by maturity group, herbicide technology, company, disease resistance, etc. 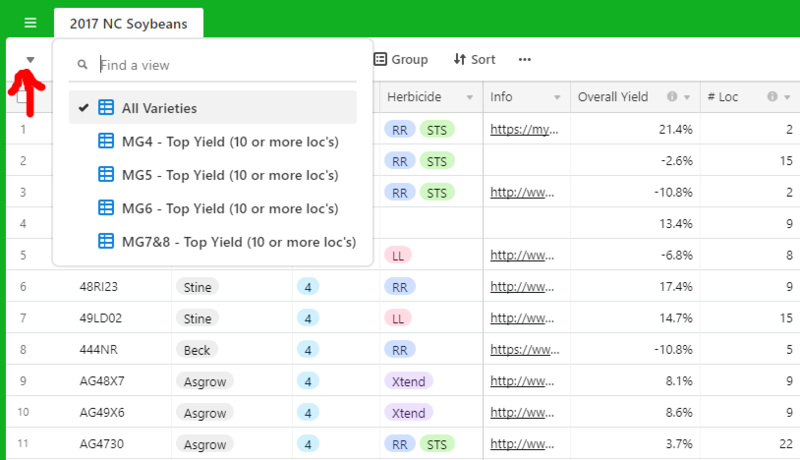 You can also sort by yield. 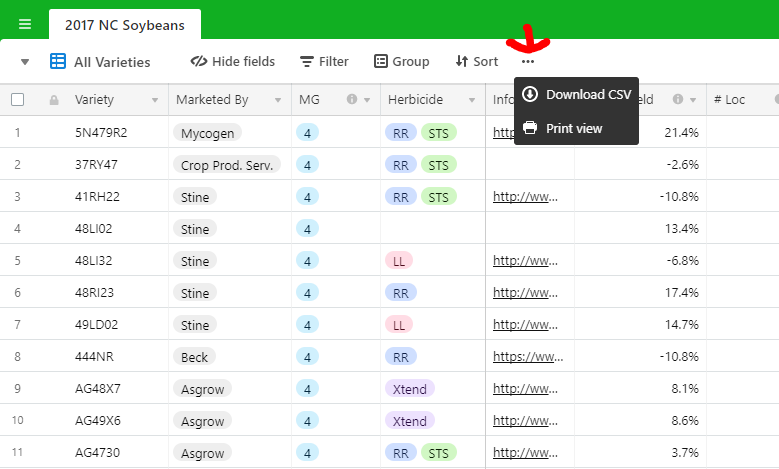 To export or print this database, click the ‘…’ button at the top of the database (beside ‘Sort’). Click the ‘View Larger Version’ in the bottom right corner to see the entire spreadsheet. 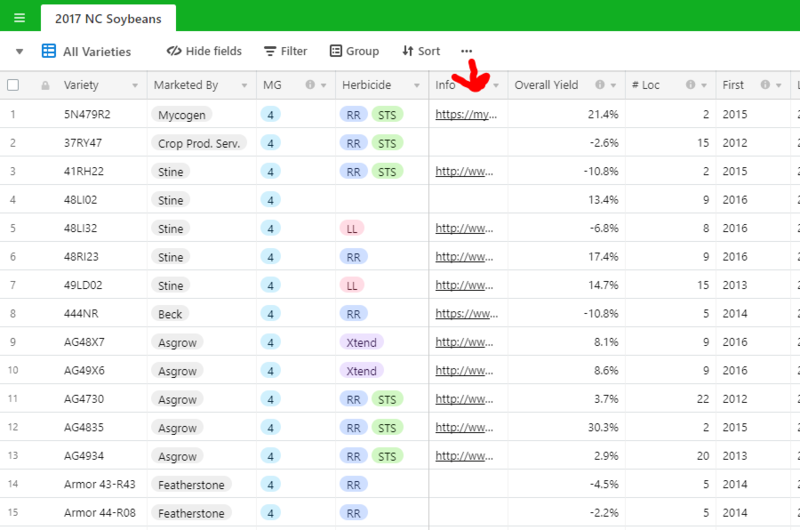 Tables sorted by yield (and filtered by maturity group) can be viewed by clicking the down arrow in the top left corner (to the left of ‘All Varieties’). These tables only have varieties with at least 10 environments of data. 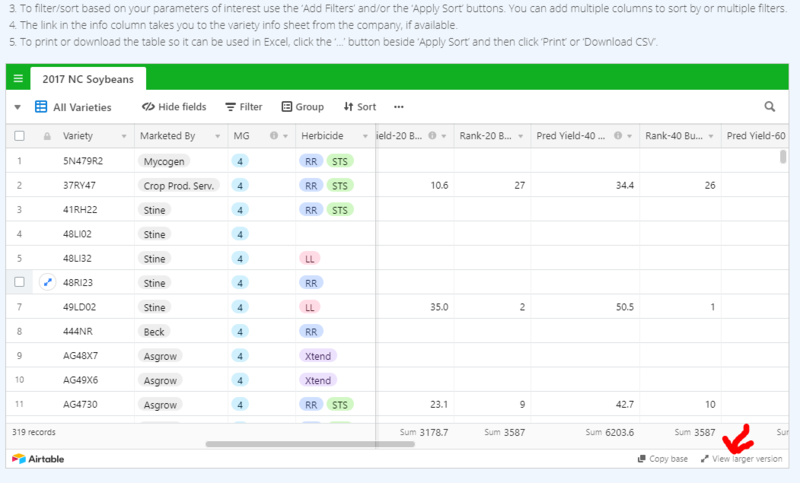 To filter/sort based on your parameters of interest use the ‘Filter’ and/or the ‘Sort’ buttons. 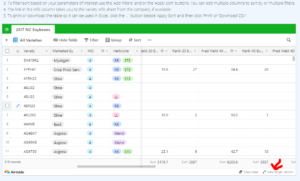 You can add multiple columns to sort by or multiple filters. The link in the info column takes you to the variety info sheet from the company, if available. To print or download the table so it can be used in Excel, click the ‘…’ button beside ‘Apply Sort’ and then click ‘Print’ or ‘Download CSV’. For an example using the selector see this post.